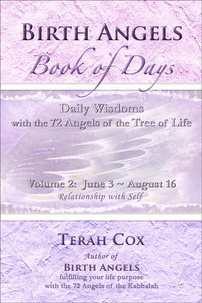 This second volume of the Book of Days features wisdoms with the 72 Angels about our most pivotal relationship during our time on Earth – relationship with self. In 72 ways, the Angels share with us that how we think and feel about ourselves, and the degree to which we are willing to cultivate who we truly are and what we love, profoundly affects how we relate to others and the value we bring to the world. From an inner atmosphere of self-love, acceptance and compassion, we can deepen the roots of Divine Love and Truth within us and in our connections with all of life. Thus when we give the particular gifts of ourselves to the whole – as true individuation aspires to – we, and all others, are not diminished but increased. "We speak of you as Divine-Human beings, and we could also say that you are divinely human, or humanly divine. But the whole truth is that all you are is of the Divine, for there is nothing that is not of God… not the light nor dust of the stars, not the breath nor the waters nor the humus of the Earth, nor any part of you or any thing or being in all the cosmos. Thus the Divine that you are is composed of both light and dust, essence and form – the mysteries of the heavens rooted in the humus of matter. …All and every part of you is Divine – fashioned with different frequencies of light, both invisible and visible. … And so to say that ‘the body is a temple of the Divine’ is so much truer than you may have ever realized." ........The great paradox of ourselves as Divine-Human beings is that the more we awaken to and call upon our inner Divinity and the qualities and powers of Divine Love and Truth within us, the more Divinely, as in wholly, human we become. As our humanity is thus Divinely and wholly “super-charged” to fulfill our greatest soul purposes and heart-longings – which reflect the desire of the Divine to know what more it can be – we ‘go forth and multiply’ our wondrous Divine-Human potential through both individuation and togetherness. The ultimate love-and-truth urge of individuation is to be and have something worthy to contribute to others from the truth of who we are and what we love to do and create. The blossoming of our individuation, which is facilitated because of our seeming “separation” from our Source, enables us to bring to the whole of humankind, and the Oneness of All That Is, more than we started with. Indeed, when all is said and done, we will hopefully have given our “Light-Seed Investor” a good return on Its investment! Our ability to do all that hinges on the kind of relationship we have with ourselves, and our willingness to allow the Divine within us to love us into greater and greater beingness.